It is interesting to know whether Finnish Shrapnel Storm decided to play the music they do first or settled on the moniker prior to that. Perhaps those decisions were made simultaneously but Shrapnel Storm music fits their name. 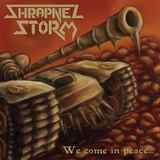 When you are very much in the mode of Bolt Thrower proffering no frills death metal the name Shrapnel Storm (closely resembling Hail of Bullets) is the way to go. On their two track demo the Finns offer very much a bottom driven sound, not too diversified in terms of songwriting, but with some quality riffs to come across. Deathroller has a cool headbang moment around 2:46 min, for example. In their desire, however, to stick to the death metal old school fundamentals they overdo it slightly in my opinion. Speaking of their sound, the bottom end is so strong with Shrapnel Storm, when I listened to the demo I had an impression of a dense mound from which the vocalist Aki's body was sticking out perhaps waist deep, as he is the only one left to be dealing with higher frequencies throughout. As a result the whole effort is somewhat one-dimensional, but somehow I have a feeling it was intentional.